"Stunningly Magical" - And Only 3 Performances Left! Only 3 performances left! Tickets for The Tempest are available on our website or by calling the Hangar Theatre at 607-273-8588. Several shows already have large blocks of seats reserved for groups, and the remaining tickets are going fast. So don't wait! The Tempest Is Almost Over! Don't miss your final chance to see this show! "Enjoyed a STUNNINGLY MAGICAL performance of THE TEMPEST last night. Wonderful stuff. A powerful experience -- and shared through time and space with countless others over the past 400 years. Really beautiful." "Amazing show! You all were a spectacular ensemble." "It was wonderful - so beautiful to look at too - costumes set acting direction. Congratz !!!!" 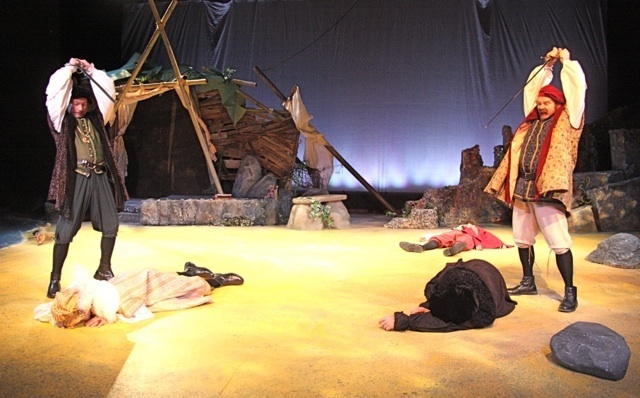 "The staging was excellent - the stage movement, especially the Tempest scene at the beginning, was perfectly choreographed and executed." "We really thought the multiple Ariel idea was a successful and novel one. Good job!" "I thought the performance was great! I loved the way Ariel was represented. I couldn't tell if the voice was pre-recorded or live, but either way, the effect was perfect - the different voices captured the various elements of Ariel's personality quite well, I thought." "Well paced, some great acting. Loved the set, lighting and the atonal rendition of the song in the play." "It was great - a wonderful night to be transported to a tropical island! The acting was wonderful, as were the sets and costumes." "I came with friends and we liked it very much. They are new to the area and were enchanted with the opening scene! Costumes were wonderful." "It was fantastic! Funny and sweet, great performances from every cast member, lovely scenery and perfect length." "Loved it. The proximity to the actors was great. The adjustments made to the text worked well. Very enjoyable. Great space to see a play. Intimate and personal." "The set, the costumes, and the acting was first-rate." "We enjoyed the evening very much! It was a great way for my wife and I to celebrate our 37th anniversary." "The night flew by! I especially loved the lead of Prospero -- I (as many do) conflate the part with Shakespeare himself, his staff with the writer's pen, and his books with his corpus; the actor's performance was natural and absorbing. The sound on the Ariels was clever & worked well. Kudos to the whole cast; everyone did a fine job."